German Shepherds are high-spirited dogs. They are active, full of vigor, and extremely intelligent. In many parts of the world, these dogs are used as sheepherders. This means they protect the herd of sheep from the eyes of predators. These dogs are full of life, and that’s why they require ample physical exercise and play to stay fit. Many owners that pet GSDs for indoor environments soon face problems when their dogs become destructive. Is this the fault of the GSDs? Or is it the fault of the owners that neglect the primary needs of their dogs? To keep your GS happy and sane, you need to know that exercise is essential for its health and well-being. If you are having troubles with your GS and want to know more about their physical needs, read on to the article below and help your dog maintain a perfect lifestyle. Why is Exercise Essential for a GS? Your energy-packed fur buddy requires physical activity to stay healthy. If you have locked your GS in an apartment’s room and wondering why it is destructing your furniture, you need to think again. Physical activity allows your GS to have fun and maintain its fitness at the same time. German Shepherds are high energy dogs that don’t like being bored. 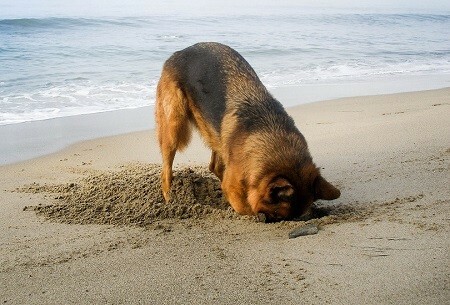 That’s why it is extremely important that GS owners keep their dog busy in different activities. If a GSD gets bored or is left alone, it reacts. It starts to dig the ground, urinate everywhere, destroy your furniture, and much more. This is a normal reaction that GS’s exhibit when they don’t get to play or exercise. Their strong body needs physical exercise. This means that as owners, you are responsible for designating few hours every day for your dog’s exercise. The exercise doesn’t have to be walking, but you can engage with your GS in some activity that allows it to get its daily dose of physical exercise. 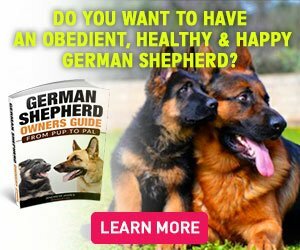 6 Best Exercising Tips for Your German Shepherd! Read on to some great and simple ideas that will fulfill your dog’s daily requirement of exercise. Moreover, it will keep your dog busy and active. What’s better than taking your dog along when you are heading out for some adventure? Many people like to hike on Hills and the Rocky Mountains. If you don’t have enough time to take your dog for a walk or play with it, take it for a thrilling hike. GS are curious dogs that like to explore their surroundings. That’s why hiking will prove to be a great activity for your dog. You can roam around valleys, hills, mountains, elevated pathways, and much more with your furry-friend. Make sure you are prepared to face any accident during your hiking trip and keep a first-aid kit with you at all times. Choose a safe hiking spot for you and your dog. Swimming is another brilliant idea for your GS’s activity. Pick out entertaining activities that you love getting involved in. If you like to swim twice a week, take your GS along with you. It is even better to swim in your home-pool with your dog. Swimming is a great way of bonding and indulging with your dog. It is also extremely fun for a GS as it will love pushing its legs in the water. If you want to make this more fun, you can play fetch in the pool (use a soft ball filled with air). Another fun way you can involve your dog in physical activity is by hiding a bone or your dog’s favorite toy in the ground or anywhere in the house. Show your dog its favorite toy or bone and then hide it. Your dog will be anxious to find it and will run around the home to look for it. This is a fun and highly energetic activity for your GS. 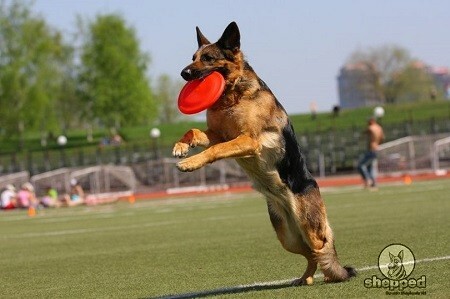 A great way to let your dog have some exercise is by fetching it a Frisbee. You can do this activity in a park that you jog in. This activity is extremely fun for a GS and gives a boost to its mood. Throw a Frisbee and tell your GS to ‘Fetch.’ Your dog will run to catch the Frisbee with its mouth. Once your GS has the Frisbee in its mouth, ask it to bring it to you by saying ‘Come’ or ‘Here.’ This activity will provide good running exercise to your dog. You can do this activity using a ball or a bone as well. If you are fond of hitting the park for a little morning walk, make sure you take your energetic GS along. GSs love to walk and the simplest thing you could do to provide them with their physical needs is to take them for a walk. Walking is the most common type of exercise for GSs. It is also very convenient for the owners. If you don’t have enough space in your backyard, choose a good park for the walk. Change parks every two weeks so that your dog doesn’t get bored of the same environment. Similarly, you can also jog along your GS but make sure you have the leash on as it will give you better control over your hyper-active dog. GSs are intelligent dogs and extremely curious, and that’s what makes them a perfect candidate for the famous Hide n Seek game. If you don’t have enough time to take your dog for a walk in the park, make use of your creative skills and play with your dog. Due to a GS’s curious nature, it will be very excited to find you when you are hiding. Make sure that you say your dog’s name when you are hiding. Think of creative and fun ways to involve in physical activity with your GS. Giving time to your dog and taking it for exercises will strengthen your bond with it!